How to Become a Forensic Scientist in Ohio? How much does a forensic scientist make in Ohio? According to the US Bureau of Labor Statistics (BLS) 2017 figures, there were 400 forensic science technicians working in the state of Ohio. O*NET OnLine projects that jobs in this field are likely to grow at 24%, which is a lot higher than the national average growth for other occupations. With statistics such as these, the future of forensic science surely seems bright in Ohio. To get into this field, however, you will need to follow a series of steps. It must be noted that the steps to become a forensic scientist in Ohio need to be taken as general guidelines, rather than the exact requirements for every job title in the field. The exact requirements would vary according to location, employer and the level of occupation you are applying for. While in high school, you are advised to take up coursework in natural sciences and mathematics, including classes in physics, chemistry, biology and calculus. These subjects would help create a strong foundation for higher educational levels in the field of forensic science. Most entry-level positions for forensic scientists would require at least a bachelor’s degree. You can complete a 4-year long bachelor’s degree in fields such as chemistry, physics, biology or forensic science. Even if you don’t go for a forensic science specialization at this point, it is recommended that you take courses in natural sciences and mathematics to better prepare yourself for the nature of your future job. According to the BLS, the minimum level of education required to become a forensic science technician is a bachelor’s degree, though individuals with master’s degrees might have better prospects. While most occupations would not require a master’s degree for entry into the profession, getting one can certainly open up new and more advance employment options for you. 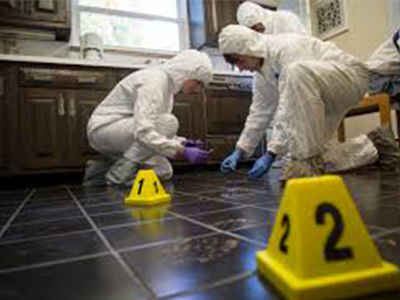 Forensic Scientists in Ohio usually work in the labs, medical examiner offices, police stations, morgues, and hospitals. They may be able to find employment at the local, state and federal government levels. Before you are given actual case work to handle independently, you employer is most certainly going to require you to complete a training session. This session would help you understand the ins and outs of your job, the workplace norms and the methods followed in arriving at conclusions. The training period may last for a few months or even a year in some cases. The timeline would vary according to the nature of the job and the employer’s requirements. According to 2017 data from the BLS, forensic science technicians in Ohio make an annual mean wage of $65,890. This is slightly higher than the national average of $61,220. © 2019 how to become Forensic Scientist. All rights reserved.